Starting from the classical and late classical periods the timbrical and dynamic flexibility of the clarinet could give to these instrument the opportunity to be easily mixed with other different instruments with surprising results. The genius of Mozart could produce unusual and unique instrumental combinations including a wonderful Quintet with piano and four winds (K 452) a Trio with viola and piano (K 498) or a Quintet with C clarinet, basset horn and string trio (K An. 90) to cite a few. In this Cd we can find two compositions of the late classical period with the unique instrumental combination of two clarinets and viola. Viola is, more than the violin, akin to the clarinet because of its compass not too high and its warmness of sound. The trio combination had been since ever perhaps the most exploited chamber group by the composers, having in it the perfect balance of the parts, with the leading instrument, a related second part and the bass part giving the harmonic support between the other two. Conradin Kreutzer was a little known German composer even though his Nachtlager von Granada and his wonderful Septet op 62 (inspired for sure by the Beethoven Septet op 20) have found some recognition since his death in 1849. He could play the clarinet, oboe, violin and piano and produced works of various genres. He wrote 50 operas, chamber music, songs, oratorios etc. He was active in Vienna where he studied with J.G. Albechtsberger and met Beethoven and Haydn. Following this time in Vienna he was appointed music director in Stuttgart as successor of Franz Danzi and later in Donaueschingen, where he had eighteen musicians at his disposition. In that city he wrote the beautiful Septet op 62 and the Quartet for clarinet and strings. Both the Trio in B flat major and the Duo in C major are pleasant Hausmusik compositions conceived with a clear late Viennese style in mind. The Duo for two clarinets is more than a mere didactic piece, well structured in five movements and with beautiful thematic ideas. Franz Krommer was also active in Vienna, in those times the musical centre of Europe, after he worked in various Bohemian courts as a teacher, concertmeister and organist. He wrote at least 9 symphonies, dozens of concertos, chamber works for string ensemble and a good number of Harmoniemusik having really good natural feelings for wind instruments. He wrote also a good number of compositions including clarinet: two Clarinet Concertos, two Concertante Symphonies for two clarinets and orchestra and six Clarinet Quartets with strings. The 13 Trios with two clarinets and viola are delightful instrumental miniatures with brief movements of different moods mostly having the first part without the indication of Minuet but a second part indicated as Trio, thus recalling the above-cited late classical Viennese style. The Trio for three clarinets had been arranged by Antonin Myslik from a Quartet in F major of Krommer, with a theme belonging to I.Pleyel. 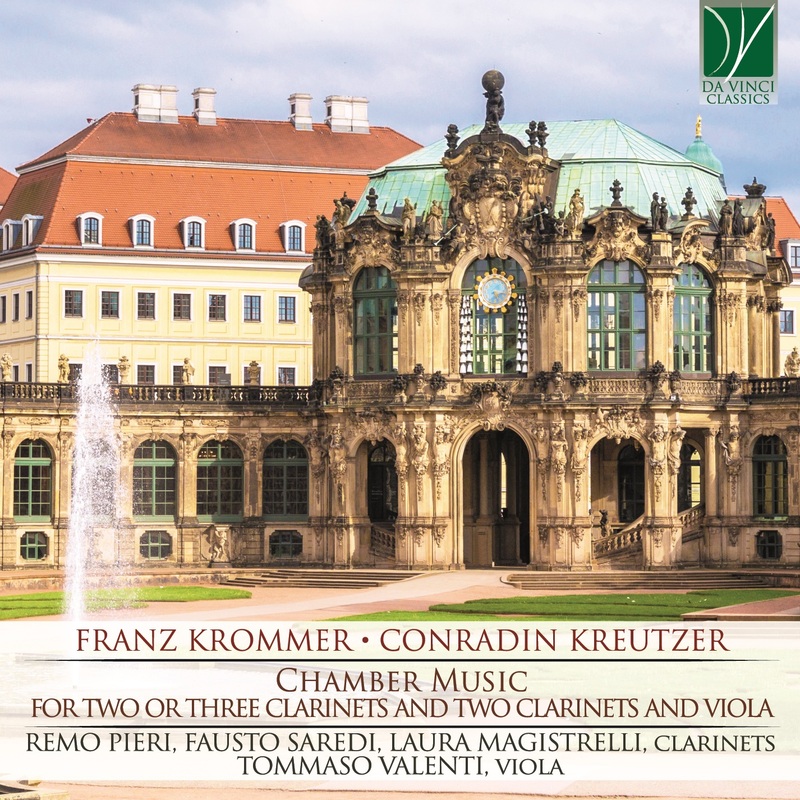 F. Krommer could express in his music wealth of original ideas, humor and spirit, harmonic idioms and striking modulations, and the content of the pieces here recorded is a vivid proof. Fausto Saredi He is serving the position of Bass Clarinet at Verdi Symphonic Orchestra of Milan since 2006. He played as extra also with La Scala Phiharmonic, Zurich Tonhalle and Opernhaus, Teatro Comunale of Bologna, O.R.T. of Tuscany, O.S.I. of Italian Swiss and for five years he played as Bass Clarinet at the National Radio Orchestra. He played under well-known conductors such as R. Chailly, S. Bichkov, W. Jurowski, C. Scimone, J. P. Saraste, C. P. Floor. He often performed the Mozart Clarinet Concerto, Rolla Basset Horn Concerto, Mozart, Weber and Brahms Clarinet Quintets and attended some important Festivals such as Biennale of Venice, Le Settimane Chigiane di Siena, Festival Pucciniano, Festival dei Due mondi di Spoleto, Rostropovich Festival di Baku (Azerbaijan) and BBC Proms of London. He recorded for per Decca, Stradivarius, RaiTrade, Deutsche Grammophone. The label Gallo of Lausanne published two Cds of his with chamber music of R. Stark and W. A. Mozart. He held master classes of bass clarinet in some italian Conservatories and summer courses. Since september 2016 he is professor at the Conservatory of the Italian Swiss in Lugano. Laura Magistrelli Born in the province of Milan, she studied clarinet at the Conservatoire "G. Verdi" of Milan with M° Primo Borali; she then attended master classes with Karl Leister, Dieter Klocker and Antony Pay. She is principal clarinet of Cantelli Orchestra since 1994 and also its president from June 2009. With it she held concerts in Italy, Germany, Austria and the U.S.A. in the most prestigious concert halls such as: Sala Verdi, Milan, Dal Verme Theatre, Milan; Accademia di S. Cecilia and Teatro dell'Opera, Rome, Maggio Musicale Fiorentino, Florence, Brooklyn Academy of Music, New York City, Mozarteum, Salzburg. Along with concert activity, with the Cantelli Orchestra, she performed for several audio and video recordings, some of which have been broadcasted by R.A.I. (Italian Public Broadcasting service), Rete4 and Canale5 (private italian television companies). She won, at the beginning of her career, the auditions for the Orchestra Giovanile Italiana, l'Orchestre des Jeunes de la Méditerranèe and Gustav Mahler J.O. ; she then held concerts with them in the most important European theatres in France, Germany, Austria, Italy, The Netherlands, Turkey, Greece, the former Jugoslavia, ex Czechoslovakia, Denmark, Spain. She played under the direction of famous conductors, such as Claudio Abbado, Riccardo Chailly, Daniele Gatti, George Prêtre, Antony Pay, Fabio Luisi, Luis Bacalov. She has also been playing as first clarinet with several orchestras: I Pomeriggi Musicali, Orchestra Haydn, Trento and Bolzano, Radio Orchestra of Milan, Milano Classica, Orchestra Città di Magenta, Stabile di Bergamo, Teatro Lirico di Cagliari, Orchestra Sinfonica Siciliana, Accademia delle Opere, Milan, Orchestra del Teatro Carlo Felice of Genova. She performed chamber music in several ensembles, varying from the duo up to the octet, also cooperating with the Soloists of Moscow, playing in Italy, France, Germany, Morocco, and in Kenya for the Italian Embassy in Nairobi. As a oloist she held her first concert at the age of 16 at the Teatro Lirico, Milan, playing the concert of K. Stamitz with the Orchestra of the Conservatoire, and then with the R.A.I. Orchestra, Milan, with the Angelicum Orchestra and many others, playing a classical repertoire. She recorded many CDs for Bayer Records, Pongo Classica, Chandos, I.C.A. (International Clarinet Association), Clarinet Classics, Centaur Records, VDE Gallo Losanna, Urania Arts, Camerata Tokyo with Karl Leister. She is Professor of Clarinet at the Conservatoire of Music "G. Verdi" of Milan. Remo Pieri He graduated at the Lucca Conservatory with prof M. Del Vicario and then studied with V. Mariozzi, C. Scarponi, G. Riccucci, D. Goracci and K. Leister. He also studied in Paris with P. Cuper obtaining unanimously the Premier Prix. At age 18 he was a member of the Opera Barga European Youth Orchestra. He collaborated with different orchestras such as: Maggio Fiorentino, Orchestra Regionale Toscana, Orchestra del “Teatro del Giglio” of Lucca, Teatro Verdi of Trieste, Toscanini of Parma, Orchestra of Bretagne, performing with well known conductors: De Bernard, Morandi, Domingo, Bellugi, Oren, Kuhn, Kovatchev, Otomo, Galli, Luisotti e many others. Since 1997 he is principal clarinet of the Orchestra Città Lirica and Festival Pucciniano of Torre del Lago (LUCCA). He performed in different European cities, China, Arabian Emirates, (first to bring there an Italian opera, Boheme of Puccini) U.S.A, Nicaragua, Brasil. With the tenor Bocelli has collaborated in an important open-air concert in Siena in front of 30.000 people. He played with famous artists such as C. Rossi, P. Vernikof, G. Stuller, A. Zemstov, A. Lieberman, A. Meunier, A. Noferini, M. Flaksman, H. Moreno, S. Pahor, L. Bartelloni, S. Orselli, C. Scarponi, P. Cooper. He usually plays with a String Quartet with A. Bologna, V. Ceccanti and F. Giovannelli. His playing has been appreciated by the composers L. Berio, G. G. Luporini, Petrassi, Bussotti and many others. He belonged to the group of contemporary music of B. Maderna conducted by F. Neri. In 2014 he was the guest artist at the Todu International Clarinet Festival and teacher at the Italian Music Academy of Camerino. He recorded for Tactus, Edipan, Shelve, Da Vinci. He was a winner of national competitions for the teaching positions of chamber music and clarinet. He is clarinet professor of Music Academy "L. Boccherini" of Lucca. Tommaso Valenti He graduated with honours in 2009 at G.Puccini Conservatory in La Spezia under the guidance of Fabrizio Merlini. He perfected himself at the Lugano Conservatory with Danilo Rossi, at Konservatorium Wien Privatuniversitat with Alexander Zemtsov and with his father, Claudio Valenti. In 2014 he obtained "Diploma Superiore di Viola" at the Academy of Santa Cecilia in Rome with Massimo Paris. He collaborates with several symphony orchestras including Malta Philarmonic orchestra and the Orchestra Filarmonica Pucciniana. Always attentive to the enhancement and rediscovery of the literature inherent in its instrument has recorded as a soloist in 2017 for the prestigious TACTUS label the unpublished concert BI552 written by Alessandro Rolla, after a careful revision and reconstruction work together with his father, Claudio Valenti. As a chamber musician, he collaborated and played with important musicians such as Kate Hamilton, Milton Masciadri, Enrico Bronzi, Richard Galliano, Alexander Zemtsov. He plays on a modern Viola built by F.Piagentini. Conradin Kreutzer (b Messkirch, Baden, 22 Nov 1780; d Riga, 14 Dec 1849). German composer and conductor. The son of a Swabian burgher, he received his earliest musical training from the local choirmaster, J.B. Rieger. From 1789 he studied theory and the organ with Ernst Weinrauch and learnt to play a number of instruments at the Benedictine monastery of Zwiefalten. In 1798 or 1799 he became a student of law at the University of Freiburg, but after his father’s death in 1800 he turned entirely to music. While still students he and friends performed his one-act Singspiel Die lächerliche Werbung. For the next three or four years he was probably in Switzerland; in 1804 he went to Vienna, where he met Haydn and was probably a pupil of Albrechtsberger. He gave music lessons and concerts in order to maintain himself, and continued to compose, though was unable to secure performances of his stage works in Vienna until 1810. From 1810 he toured Germany and elsewhere demonstrating Franz Leppich’s semi-mechanical ‘panmelodicon’. He spent the winter of 1811–12 in Stuttgart, where the operas Konradin von Schwaben and Feodora were successfully staged. Following Danzi’s resignation Kreutzer was appointed Hofkapellmeister with effect from 10 July 1812. That autumn he married for the first time; his daughters Cäcilie and Marie (the latter from his second marriage) became singers. Although he gave up his Stuttgart post in 1816 owing to intrigues, his friendship there with the Swabian poet Johann Ludwig Uhland, one of Germany’s foremost lyricists and ballad writers, was of far-reaching importance for his later development. The work from this period on which he based his highest hopes was the through-composed ‘heroic opera’ Orestes, with which he intended to bridge the gap between Gluck’s two Iphigenia operas; after fruitless attempts to have it staged in Berlin, and then in Vienna, it was finally produced in Prague in 1818, but was a failure. After he left Stuttgart Kreutzer spent some time at Schaffhausen before becoming Kapellmeister (1818–22) to Prince Carl Egon of Fürstenberg at Donaueschingen. He made several tours while still nominally engaged there, and the lyric-tragic monodrama Adele von Budoy dates from this period. It was commissioned for Anna Milder Hauptmann, but enjoyed success only when revised for Wilhelmine Schroder-Devrient at Vienna in 1823 under the title Cordelia; she also performed the role in Paris. Following the successful production of his opera Libussa in Vienna in 1822, Kreutzer was appointed Kapellmeister at the Kärntnertortheater; he held the post until 1827 and from 1829 to 1832. Between these spells at the Vienna court opera he was in Paris. In 1833 he moved to the suburban Theater in der Josefstadt, in response to an invitation from the ambitious director, Stöger. He was Kapellmeister there from 1833 to 1835, the period that saw the first performances of his two greatest successes, Das Nachtlager in Granada and Der Verschwender. 1833 saw the première in Berlin of Kreutzer’s settling of Grillparzer’s Melusina, which the poet had originally written for Beethoven in 1823. Although Kreutzer was back at the Kärntnertortheater from 1835, it was at the Josefstadt that the opera Die Höhle bei Waverley was given in 1837. In the 1840s he accompanied his daughters on concert tours and was city music director at Cologne, 1840–42, as well as working in Mainz, 1844–5. He was mentioned in 1846 as Nicolai’s likely successor at the Vienna Hofoper, but the negotiations came to nothing and in 1848 he moved to Riga. During the 1840s a number of German theatres staged Kreutzer’s operas, though these were more succès d’estime than triumphs: Brunswick, Wiesbaden, Darmstadt, Hamburg and (posthumously) Kassel each staged one of his new operas in the years following his final departure from Vienna, but none of these houses seems to have invited him back to mount another. Tastes were changing; the esteemed master of Das Nachtlager and Der Verschwender had nothing original to offer a public that was experiencing the early operas of Wagner. Kreutzer’s music has never been entirely forgotten. His Uhland settings for male-voice chorus long remained popular. Das Nachtlager used to be revived occasionally in Germany and a few of the solo songs are still sometimes heard; above all, his score for Raimund’s ‘romantic magic tale’ Der Verschwender continues to be performed regularly in Austria. Despite the power of some of the big numbers in Das Nachtlager and the sure sense of dramatic timing and instrumental colour in Der Verschwender (the beggar’s song ‘O hört des armen Mannes Bitte’ is, with its haunting, melancholy beauty, not unworthy of Schubert; its insertion within a roistering chorus is a touch that Weber would have admired), Kreutzer is at his most characteristic in simple, expressive songs, such as the beggar’s ‘Habt Dank, ihr guten Leute’ and Valentin’s ‘Da streiten sich die Leut herum’ from Der Verschwender, and the once-famous romance ‘Ein Schütz bin ich’ from Das Nachtlager, or some of the atmospheric Uhland settings. His effective instrumentation and lively feeling for rhythm and local colour are shown in many of his works, probably nowhere to more telling effect than in the charming (and briefly poignant) Septet in E op.62 for wind and strings. Several of his chamber works and songs have now been republished and many of his works have been recorded. Franz Krommer (b Kamenice u Třebíče, 27 Nov 1759; d Vienna, 8 Jan 1831). Czech composer. He was the son of the innkeeper and later mayor of Kamenice Georg Krommer (Jiří Kramář, 1737–1810), and the nephew of the composer and choirmaster Anton Matthias Krommer. He is often known as ‘Krommer-Kramář’. From the age of 14 until Krommer was 17 he was taught the violin and organ by his uncle in Turan; he taught himself theory. After about 1777 Krommer was temporary organist in Turan. In 1785 he moved to Vienna and after staying for one year found employment as a violinist in the orchestra of the Duke of Styrum in Simontornya (Hungary). Two years later he was promoted to the post of musical director. Towards the end of 1790 he became Kapellmeister of Pécs Cathedral; after 1793 he acted as Kapellmeister and composer in the service of a Duke Karolyi and later of Prince Antal Grassalkovich de Gyarak. Returning to Vienna in 1795, Krommer presumably taught composition before being appointed Kapellmeister to Duke Ignaz Fuchs in 1798. In 1806 he applied, unsuccessfully, to join the Vienna Hofkapelle as a violinist; after 1810 he was employed as Ballett-Kapellmeister of the Vienna Hoftheater. On 14 June 1815 he was appointed Kammertürhüter to the emperor, and in this office accompanied Emperor Franz I to Paris and Padua in the same year, and to Verona, Milan and Venice in 1816. From 13 September 1818 until his death he succeeded Leopold Anton Kozeluch as the last official director of chamber music and court composer to the Habsburg emperors. Krommer was one of the most successful of the many influential Czech composers in Vienna at the turn of the 18th century. His creative output comprises over 300 works, although he only began to publish them in later years. Krommer’s reputation is attested by the rapid spread of his compositions in reprints and arrangements by German, Danish, French, English, Italian and American publishers, and equally by his honorary membership of the Istituto Filarmonico in Venice, the Philharmonic Society in Ljubljana, the Musikverein in Innsbruck and the conservatories in Paris (1815), Milan (1818) and Vienna (1826). With the exception of piano works, lieder and operas, Krommer cultivated all the musical genres of his time, and was regarded (with Haydn) as the leading composer of string quartets, and as a serious rival of Beethoven. The present view, however, places his solo concertos for wind instruments as his most individual accomplishments. In his symphonies, solo concertos and chamber music he followed the style of Haydn and Mozart, and yet his modes of expression extend from the galant style of the earlier 18th century to Romanticism. His violin duets have proved to be his most lasting works: they were still in use at the end of the 19th century as instructive pieces for students. His violin concertos, however, are largely forgotten: they were modelled on those of Pierre Rode, and the demands of their solo parts allow some insight into Krommer’s own ability on the violin; but his chamber music with piano shows a lack of familiarity with the technical possibilities of keyboard instruments. His numerous dances, marches and compositions for brass band, all within the Viennese tradition for these genres, are of special interest when compared with similar works by Beethoven. Krommer’s son August Krommer (b Vienna, 1807; d Vienna, 27 March 1842), an insurance agent in Vienna, was for a time a violinist in the orchestra of the Burgtheater, and also appeared in public as a pianist in 1833.